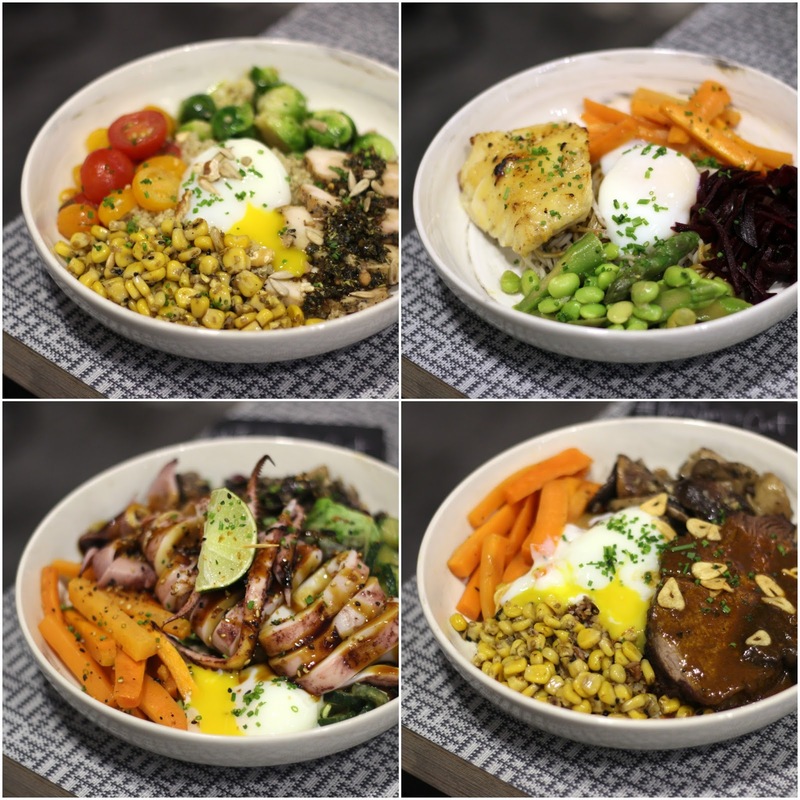 Ninja Cut - Matcha Hotcake & Hearty Rice Bowls @ Seah Street | JACQSOWHAT: Food. Travel. Lifestyle. 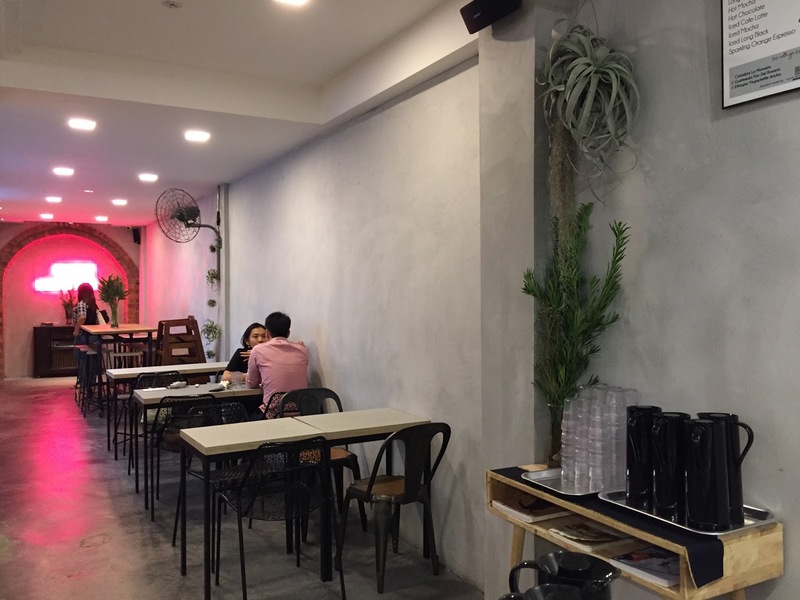 The new space is decked in slate grey interiors and a industrial-chic design, instagrammable spot is definitely near the entrance with bar seating. There is a large table at the end of room perfect for 6 to 8 guests. The menu is reft into four section such as Ninja Cut rice bowls, brunch, small bites and desserts which is cakes on display. As for rice bowls, substantial meal here comes with an option of bases such as soba noodles, quinoa, a proprietary rice blend, and garden greens. There were about 10 different variations of rice bowls on the menu and we had 4 of them, all of which packed with hearty proteins. For fish lovers, Oh My Cod! $18 is for you, it comprises of baked miso cod, pickled beets, carrots, asparagus & edamame. Bases are available for a top up of $2. For a post-workout protein hit? Gimme Chimi Chicken $14 features a tender and juicy piece of sous-vide cajun-spiced chicken breast, as well as sautéed Brussel sprouts, tomatoes, grilled corn and mixed nuts. For carnivores, I mean the die-hard meat lovers, What's Your Beef $16 is definitely for you and only 30 servings per day. The 150g Australian ribeye is roast to medium-rare doneness and marinated with simple aromatics like thyme, salt and pepper. Alongside with grilled corn, sautéed mushrooms, honey-glazed carrots, onsen egg and golden garlic chips. For the seafood lovers, one of them is Squid Fix $18 where it features a whole Japanese squid that it is gently grilled and sliced after. For sides, it is served with sautéed mushrooms, miso cucumbers and honey-glazed carrots. Pleasantly surprised each ring of squid is bite tender, the only complaint was that it was a little salty. From the all-brunch menu, you can expect to see the Polenta Mash $18 where it showcases a homemade aburi chashu roulade with a side of truffle polenta mash, sautéed mushrooms and Parmesan cheese shavings. The mash was extremely fine and smooth, infused with a distinctive truffle aroma. This is Ninja Cut's take on Southern-Creole breakfast of pork and grits. I would recommend to share as some may felt that the truffle was overwhelming. The Cheeky Cheese $18 was a crowd pleaser and also dedicated to beef lovers. 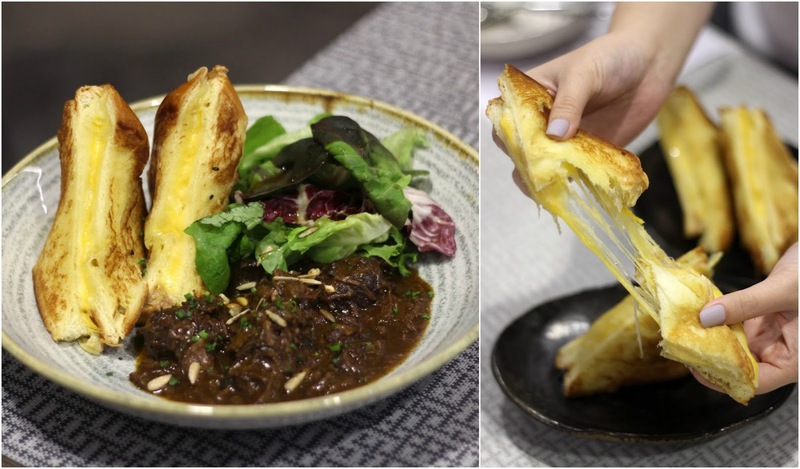 Ninja Cut does it's own Japanese curry rendition, the beef cheek is seasoned with red wine and braised in the curry for a whole day. When braised, these beef cheeks become meltingly tender and soft, but some may find it gamey. The dish is then paired with an oozy grilled cheese brioche sandwich, perfect for sopping up gravy. Look at that prefect cheese stretch. Using the same recipe from Babette's matcha lava cake, Ninja Cut makes a massive version and here you go - Marvellous Matcha $16. The matcha 'hotcake' is filled with green tea fondant, then topped with ricotta cheese, speculoos crumble, caramelized yuzu peel, azuki beans and homemade dango. Mad love the hotcake texture, that first bite was a little crisp around the edges and filled with warm gooey center of matcha lava. The speculoos crumble and glazed yuzu peel gave a crunch and overall compliments the soft and velvet-like centre. As the dish is created to order, it requires a 15 to 20-minute waiting time. Apart from rice bowls and a couple of brunch items, the menu also features interesting treats such as bacon asparagus tempura and sweet potato fries doused in mentaiko cream. Ninja Cut certainly adds on the dining options in Cityhall vicinity, will absolutely be back for the crackling pork belly bowl.